One of the most exciting things about having an online decorating service is receiving "after" photos in my email inbox. The other day, I got some. Before I share them, let me tell you a little about this project. 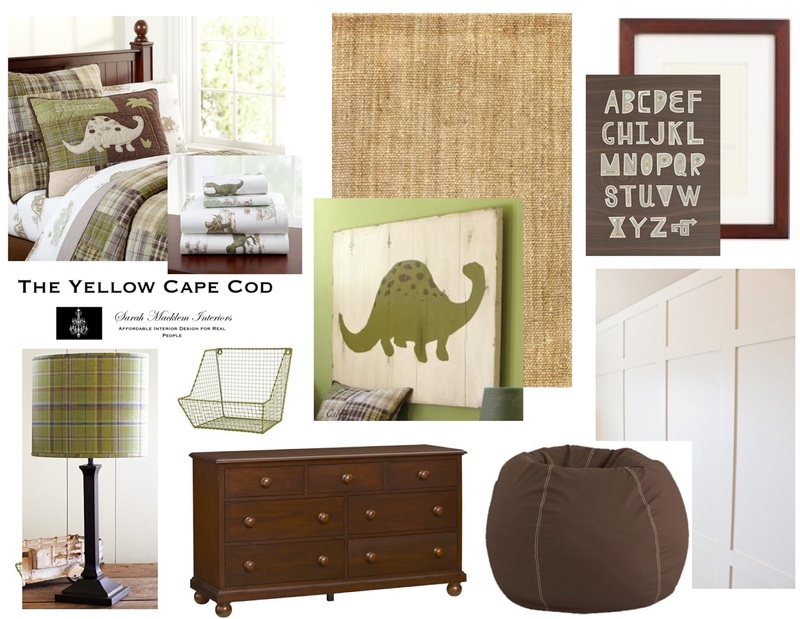 Veronica came to me for an online design plan for her youngest son's room. 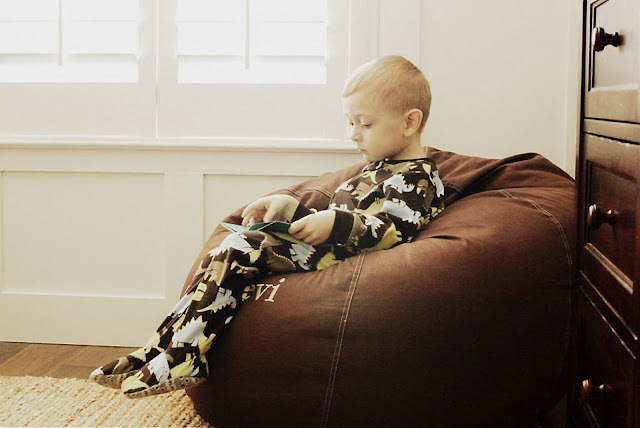 Little Levi was ready to transition from his toddler bed to big boy furniture. 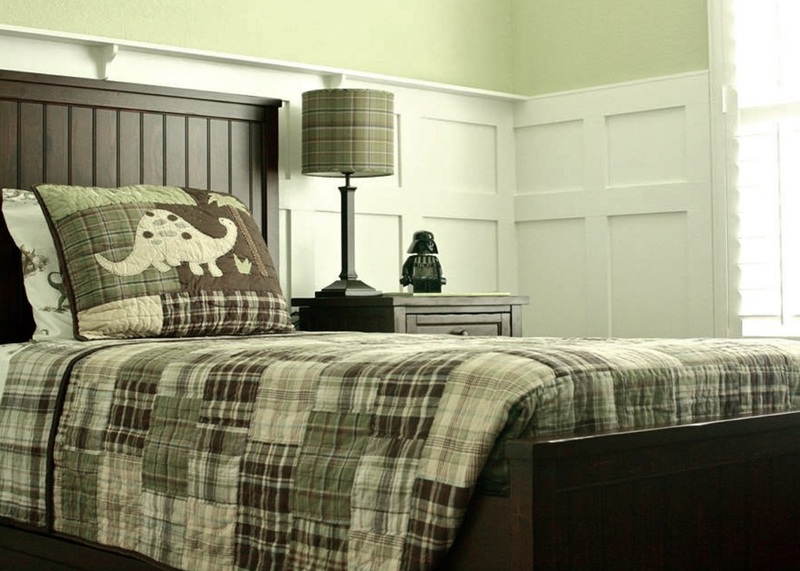 He was suffering from allergies which required the carpets be replaced with hardwoods. These changes prompted a room redesign. After filling out my project questionnaire, Veronica submitted measurements and photos of the space. Here is a look at the room "before". Using the information provided by Veronica in her project questionnaire, we created a step-by-step design plan that included a custom wall treatment, new furniture, bedding, lighting, rug, wall color and accessories. ...a true to scale floorplan illustration and step by step instructions on how to put the space together. We gave Levi a custom design that will grow with him through the years. 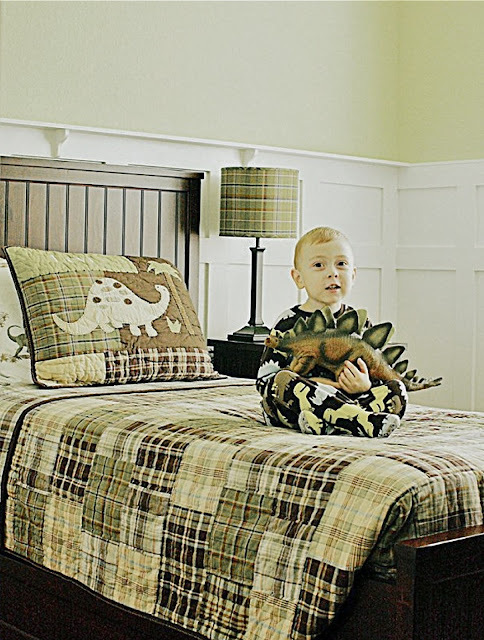 Currently, Levi loves dinosaurs. We incorporated dinosaurs with bedding, art and accessories. When the day comes that he has an affection for something else, these items can easily (and affordably) be swapped out. 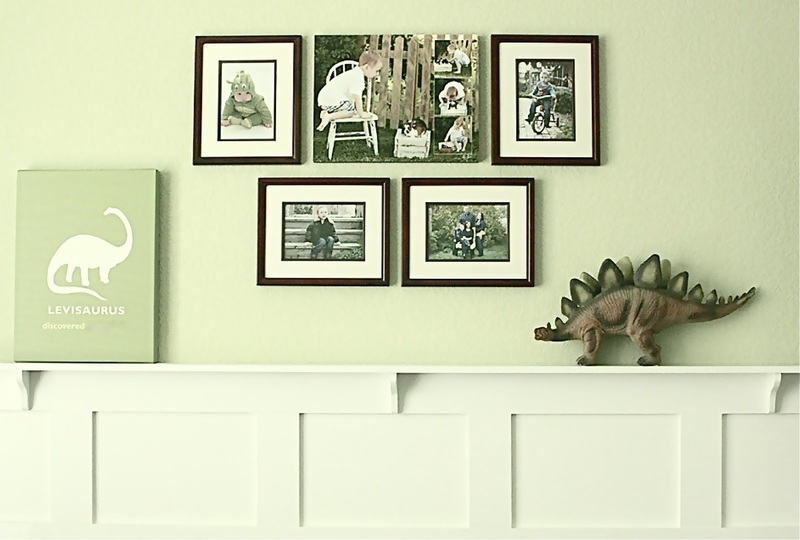 His space was customized with a gallery style photo arrangement over his new dresser. We added a narrow ledge into the custom wall treatment to provide an interchangeable display surface for art, toys, accessories and other little boy necessities. A small corner next to the dresser was claimed as a reading nook. An oversized bean bag is a cozy spot for quiet time. 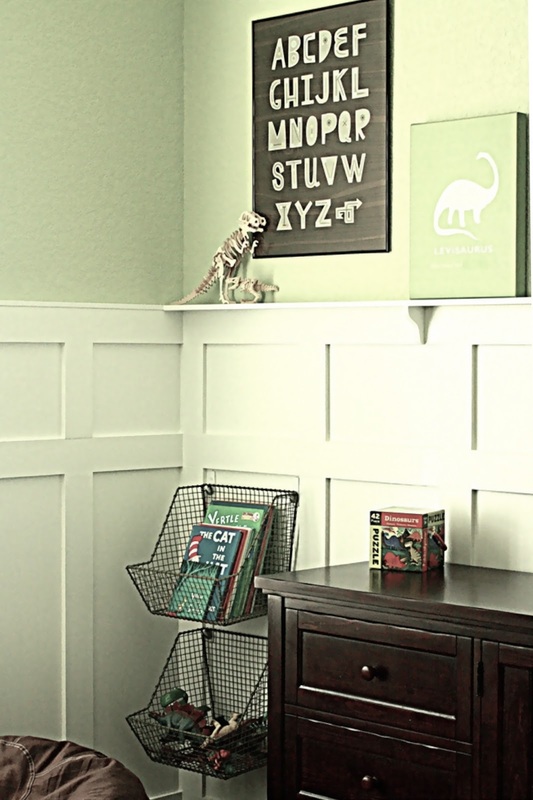 To hold Levi's favorite books (and some of his toys) we recommended these adorable green wire baskets. We suggested that Veronica mount them low on the wall within his reach. 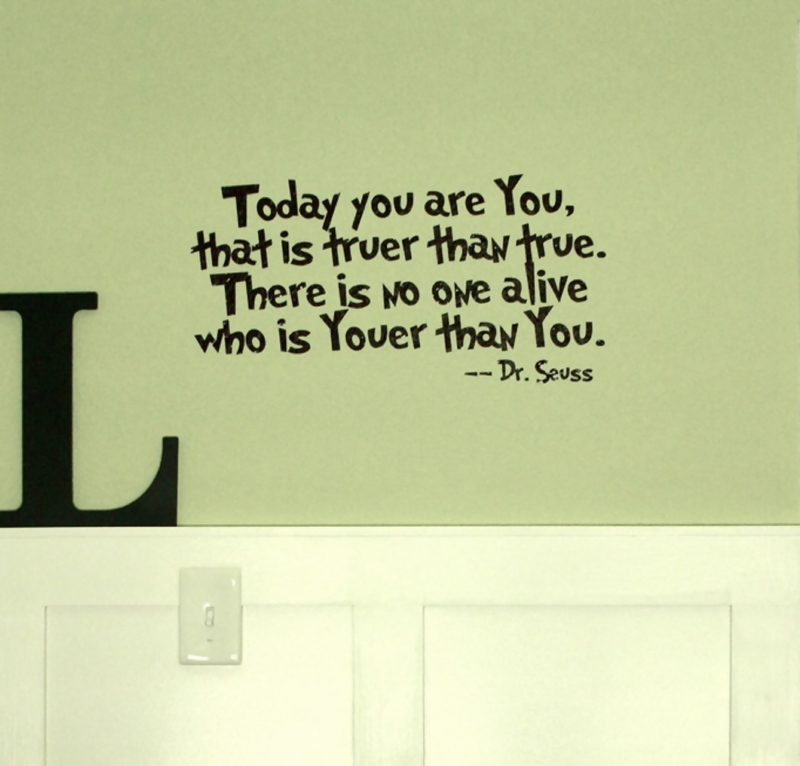 One of Veronica's requests was to incorporate this sweet Dr. Seuss quote into the new room. 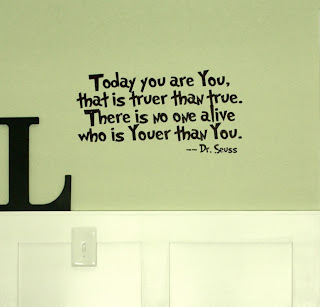 The black writing pops against the new soft green wall color. 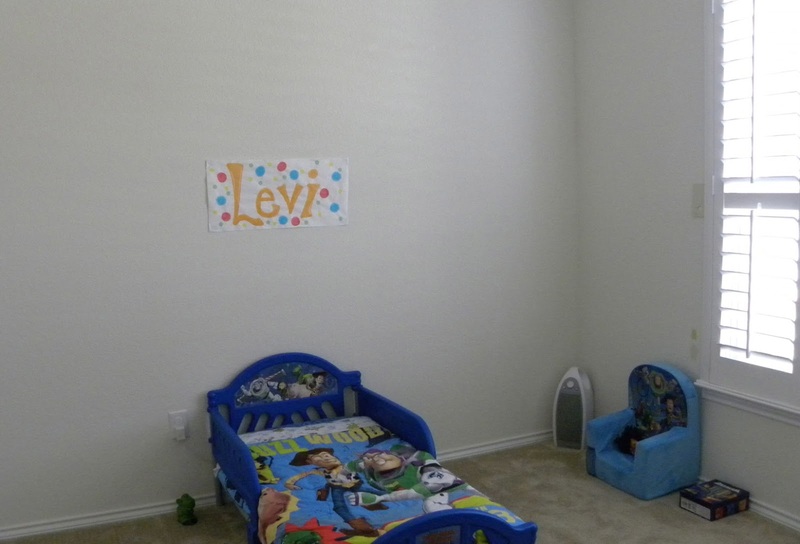 Thank you, Veronica for giving us the opportunity to design this space for Levi. These photos of him enjoying his new room made my day. This room look absolutely amazing. I especially love the white in contrast to the yellow. Sooo cute and clean. And the wire baskets are something that I will now put in my son's room. Love that idea. This may be a silly question, but when you do wall treatments like that, do you want the wall and the wood trim the same finish of paint or do you paint the trim semi-gloss and the wall portion flat/satin/eggshell? that is a pretty dramatic before and after! Where do you find those wire baskets? They are adorable.